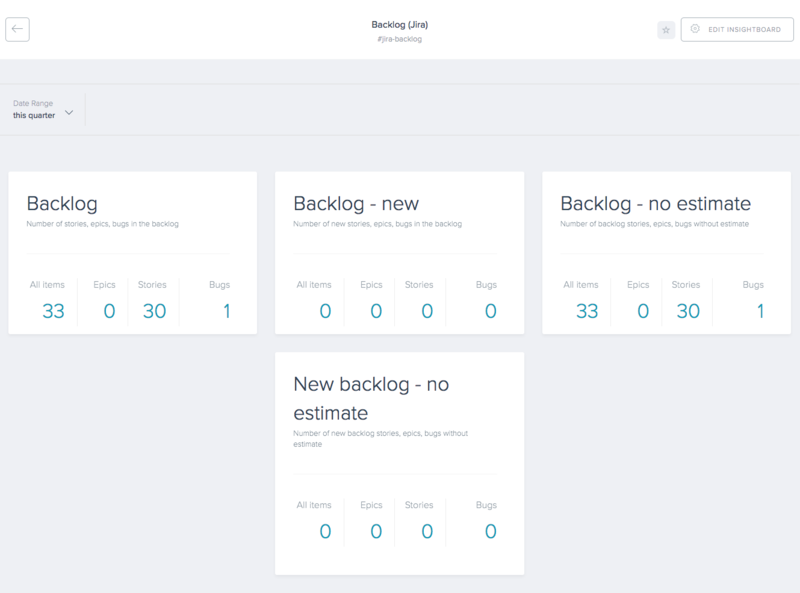 Use Jira to power your OKRs with Gtmhub. Gtmhub comes with following out-of-the-box insights for popular project management software JIRA. 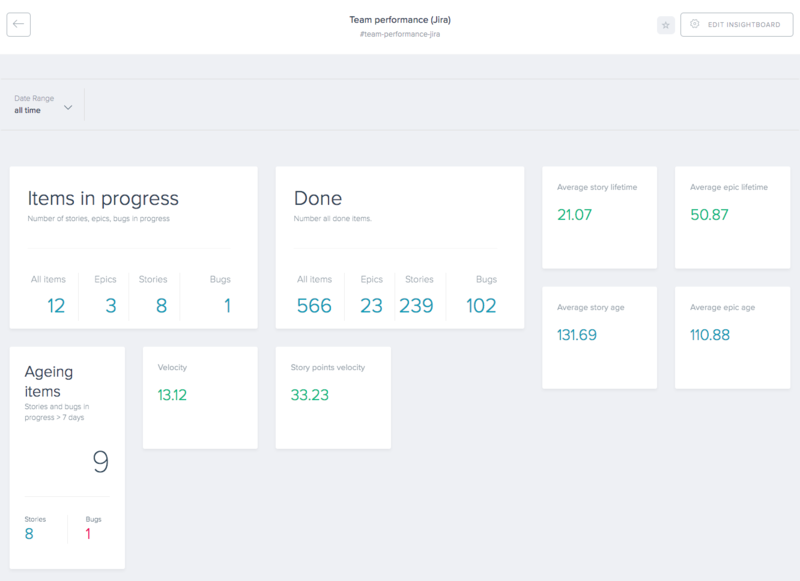 Gtmhub comes with following out-of-the-box insights for popular project management software JIRA. the count of epics, stories and bugs that are in progress. the count of stories and bugs that have been in progress for more than 7 days. average amount of time it takes a story to be closed since it is opened, in days. average age of stories that are not done. average amount of time it takes an epic to be closed since it is opened, in days. average age of epics that are not done. the velocity of the team in a given time period in terms of completed stories and bugs. the velocity of the team in a given time period based on the story points assigned to items. the number of stories in progress in a given time. 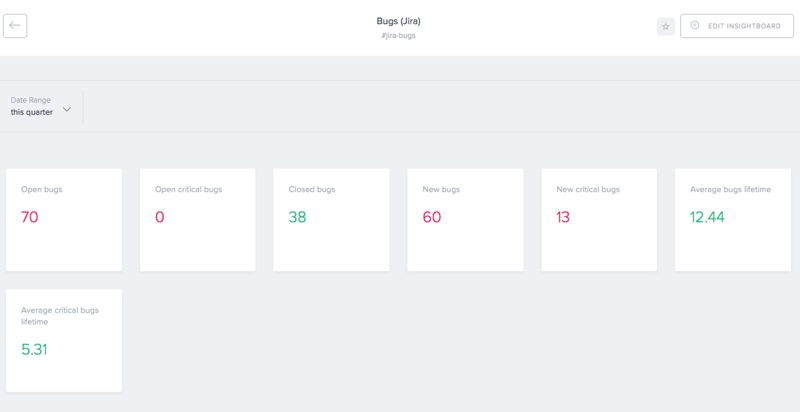 the total count of open (not started or in progress) critical bugs (highest priority). the total count of epics in progress. the total count of closed epics in the selected time period. the number of items assigned to the person with most items in a given time period. Show also the name of the person. The insight can be filtered by time period, e.g. last quarter. the number of items assigned to the person with least items in a given time period. Show also the name of the person. The insight can be filtered by time period, e.g. last quarter. the sum of story points assigned to the person with most story points in a given time period. Show also the name of the person. The insight can be filtered by time period, e.g. last quarter. the sum of story points assigned to the person with least story points in a given time period. Show also the name of the person. The insight can be filtered by time period, e.g. last quarter. the number of epics, stories, bugs and other items with status backlog. the number of epics, stories, bugs and other items added in the backlog for the selected time period (status is backlog). the number of epics, stories, bugs and other items that do not have estimates. the number of epics, stories, bugs and other items added in the backlog for the selected time period, which do not have estimates. The insight can be filtered by time period, e.g. last quarter.